Home » FAQs » What material is my bath made from. Baths are generally made from one of a few types of material; acrylic/gel coat on a fibreglass base or enamel on a cast iron or pressed steel base. 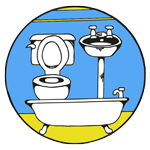 Very occasionally you might get a stone resin or ceramic bath but these types of sanitary ware are generally reserved for Shower trays, sinks, bidets or toilets. 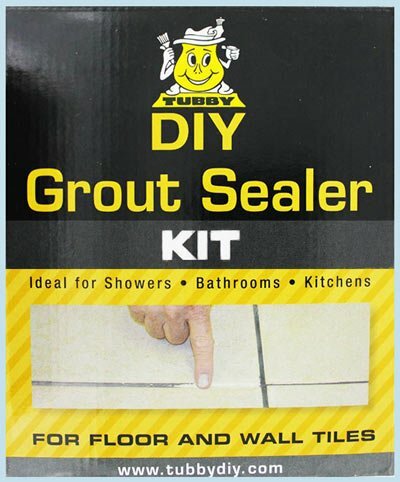 All types of baths can be resurfaced or have chips repaired, and Tubby have a range of DIY products to suit any bath surface. Our Tubby coating material has been uniquely formulated with the sole purpose of sanitary ware resurfacing, taking into account the specific stresses that this material will need to stand up to; such as UV exposure and significant temperature changes. This is in contrast to other inferior products that are often either generic plastic repair products or boat repair products that have been re-packaged and rebranded for the bath repair market. Sometimes also described as a “plastic” baths, acrylic baths are the most common type of modern baths. They tend to be fitted into a corner position with a flexible front panel or are replicas of traditional free standing roll top baths. Generally they are thinner and lighter than other types of baths and will have a higher degree of flexibility and movement than cast iron or pressed steel baths. Cast iron baths are, as the name would suggest made from iron and likewise pressed steel baths are made from steel, both will have a vitreous enamel coating over the top of the metal base. They often feature rolled tops and decorative feet, you can still buy brand new metal baths but due to there ‘traditional’ look it is quite common for old metal baths to be refurbished and reused when the interior design requires that traditional feel. Cast iron baths often feature rolled tops and decorative feet, but can also have square edges and be built in against a wall. Pressed steel baths will generally have square edges and are designed to be built in against 3 walls in the same way a standard acrylic bath would be. It is quite common for old metal baths to be refurbished and reused when the interior designer requires that traditional feel. Cast iron and pressed steel baths are often referred to as ENAMEL baths, in-fact enamel is actually used to coat a cast iron bath, this enamel coating is melted onto the bath and provides a heat resistant layer to protect the bather when they are resting inside the bath. If your bath is made from Cast Iron or Pressed Steel, it will be heavy, completely inflexible and as ferrous metal – will be magnetic.. If you have a stone bath, you will know about it. It will be extremely thick and heavy. In-fact you are more likely to have a stone bath than a ceramic bath. You will however, find that most bathroom sinks and toilets are ceramic. 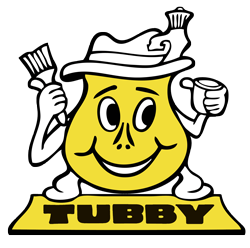 As with any of the other materials mentioned the Tubby formula is suitable for all stone or ceramic baths, sinks and toilets. If you’re still unsure what type of bath you have then please do get in touch and if you’re wondering which Tubby product to use then check click HERE for quick guide.